"Who doesn't have a Yellow?" I asked, minutes before the end of the first half. That about sums up the semi-entertaining match I attended between the Chicago Fire and the expansion San Jose Earthquakes on Saturday night. The match ended in a nil-nil draw, and featured seven yellow cards, four to the Fire and three for the Quakes. 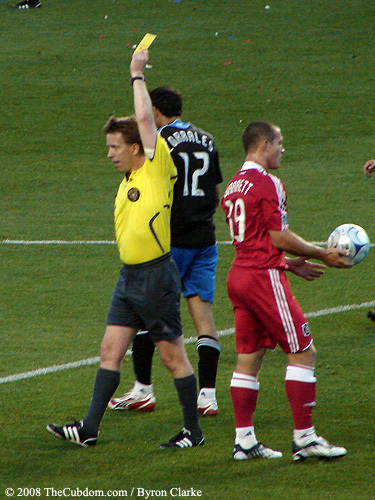 Andrew Chapin awards a yellow card, one of seven handed out in the Chicago Fire vs. San Jose Earthquakes match. See more Fire pictures in the photo gallery. For the Fire, the match was another squandered opportunity to pick up three points in pursuit of the Supporters Shield. The offense, so potent in victories against the New York Red Bulls, New England Revolution, and D.C. United earlier this season, has disappeared once more. The Fire have now gone 333 minutes of league play without a goal, and have scored only once in the last four matches. Coach Dennis Hamlett clearly attempted to address the recent struggles by starting Tomasz Frankowski and Andy Herron up top versus the Quakes. However, about ten minutes into the match, Andy Herron attempted a bicycle kick in the box and landed awkwardly, apparently losing consciousness. Stretchers were brought onto the field, but Herron walked off the pitch under his own power and even returned to the match for a few minutes before being substituted for Chad Barrett in the sixteenth minute. 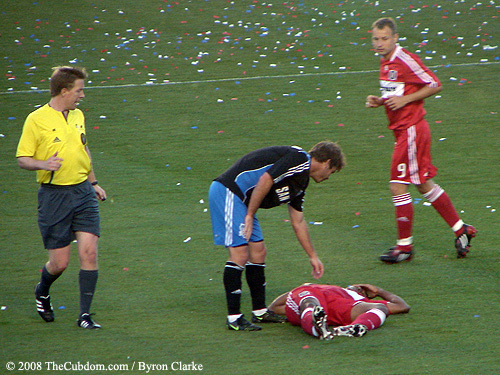 Striker Andy Herron of the Chicago Fire lies unconscious in the box after attempting a bicycle kick and landing awkwardly. Barrett played better than he did in his disastrous match against FC Dallas last week, but failed to find the back of the net, or get off any quality shots. Chris Rolfe was substituted in for the ineffective Tomasz Frankowski in the 65th minute, but only manufactured one quality opportunity, which unfortunately did not make it onto the scoreboard. Even though the offense was as disappointing as the last few matches, the defense was much improved. Gonzalo Segares returned from Costa Rican national team duty, and Wilman Conde is healthy again. Segares and Conde were joined on the backline by Bakary Soumare and Diego Gutierrez, who were both solid as usual. Combined, the back four effectively shut down the Quakes and thus Jon Busch was not required to make any show-stopping, jaw-dropping saves that are quickly becoming his trademark. The midfield of Just Mapp, John Thorrington, Brandon Prideaux, and Cuauhtemoc Blanco were solid but not spectacular. Blanco seems to be showing some wear and often needs one more step than he has time for in order to deliver magnificently placed balls, and Justin Mapp contines to slow the momentum of the attack by dribbling too much. With the tie, the Fire now have 20 points on the season and have fallen into a tie for fourth place in the Eastern conference table. I've uploaded a bunch of photos from the game to the photo gallery. Click here for Fire vs. Earthquakes photos. As an exercise, I compiled a list of the 2008 Cubs Payroll, (thanks to the USA Today Salary Database), assuming league minimum salaries for players not listed. I then recreated the active roster for each game of the 79 games the Cubs have played to date. (I used the Cubs official transactions log. What follows are two charts. 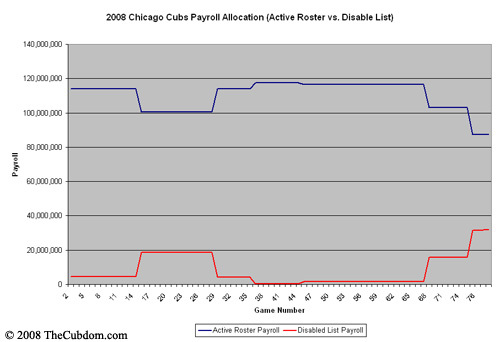 The first shows the Cubs payroll amount on an annual basis for each game played for both the active roster (25 man) and the disabled list. The second chart is a pie chart showing the income allocated to the active roster, the disabled list, and the minor leagues where the minor league amount only represents those players who have seen active roster time at one point this year. Yes, you can file this under elaborate explanations of things we already knew intuitively, but that's what I do here. Cubs players currently on the disabled list: Carlos Zambrano ($16 mm), Alfonso Soriano ($14 mm), Reed Johnson ($1.3 mm), Angel Guzman ($401K). 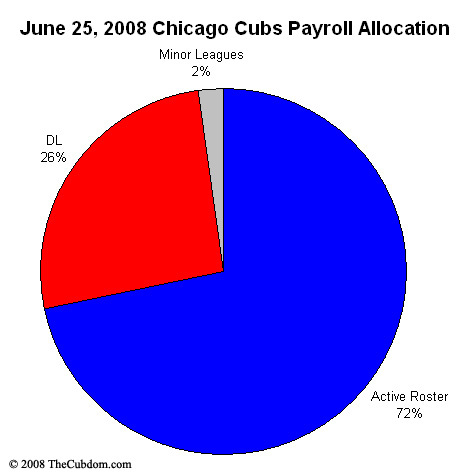 Even with 26% of the payroll injured, we're nowhere near where we were in May 2004. Anyhow, the Cubs were apparently expecting this truck as a few minutes after the driver parked it, they started carting out pallets full of empty beer cans. I counted four pallets just like the one being loaded onto the truck in this picture. 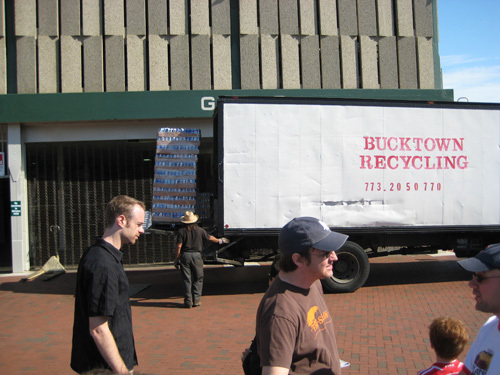 Bucktown Recycling - the official recycler of the Chicago Cubs? • The greatest Ryne Sandberg fan page on the interwebs. • The Ryne Sandberg Appreciation Day program (4 MB download). As the Cubs and Sox get underway this weekend, it's a bizarre coincidence that both managers from the 1998 showdown have recently found their first managerial jobs since the last time they were with their respective clubs. Earlier this week, the Mets fired Willie Randolph and have replaced him on an interim basis with Jerry Manuel. Manuel has not been a Major League manager since the White Sox let him go in 2003. 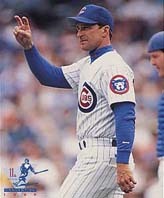 In a freaky coincidence, former Cubs manager Jim Riggleman finds himself in the mirror reflection of Manuel once more. The Mariners fired Bill Bavasi on Monday and interim GM Lee Pelekoudas relieved manager John McLaren of his duties. Who replaced McLaren? Not former Cubs hitting coach Jeff Pentland, who was also fired, but Riggleman. Like Manuel, Riggleman hasn't managed in the majors since he was replaced by Don Baylor after a disappointing 1999 season. 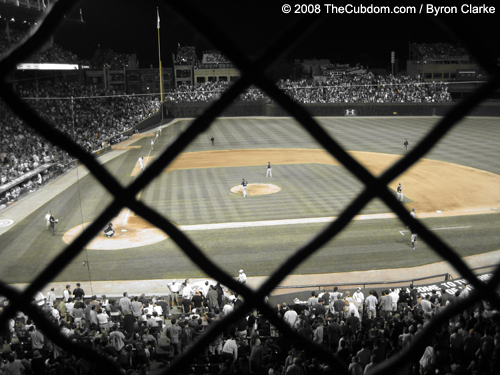 Despite each receiving interim tags, neither former Chicago manager may be there long. In Seattle, they're apparently considering anyone who's been affiliated with Major League Baseball in the last two decades... including the Peoria Chiefs manager, Ryne Sandberg. One more intriguing wild-card name: Ryne Sandberg, Hall of Famer and pride of Spokane, now managing, and reportedly well, in the Midwest League with the Peoria Chiefs, a Cubs Class A team. What do you think, should Ryno take the job in Seattle if it's offered to him? Would he? 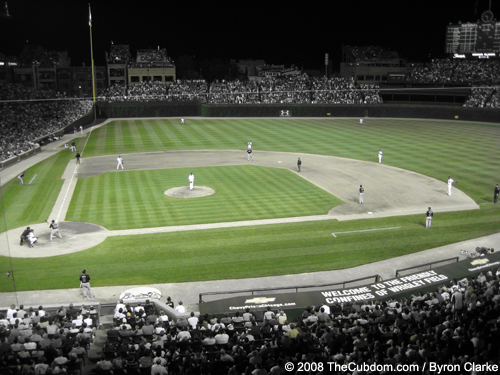 Ryno's coming to Wrigley Field in July. I've already examined how this came about, now let's whip out our calculators (or Excel spreadsheets as the case may be.) and see if we can't get an estimate of the increased revenue to the ball club. 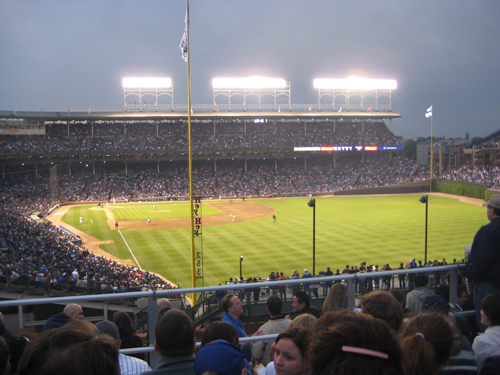 For this exercise, I used my Cubs 2008 media guide to find the breakdown of the Wrigley Field seating capacity. Then, I visited the Cubs site to find the price of Cubs tickets for this game. The results and a short discussion are below. 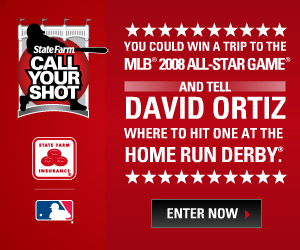 The first thing I noticed is that the Cubs aren't selling tickets to any of the upper deck seats. That will take the Wrigley Field seating capacity down from 41,160 to 30,567 for the day. All in all, I had expected the total revenue bump would be larger than it looks like it will be, but it's still a no-brainer for the Cubs. 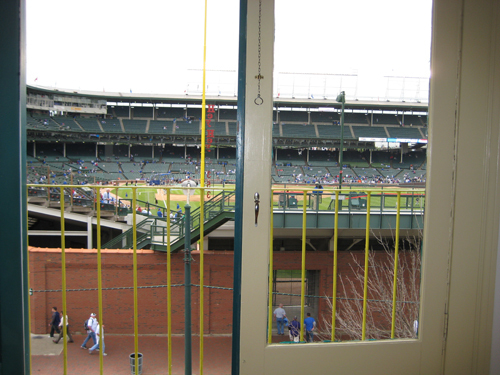 On Tuesday, I had the opportunity to attend a game in one of the Cubs Mezzanine Suite Luxury boxes. 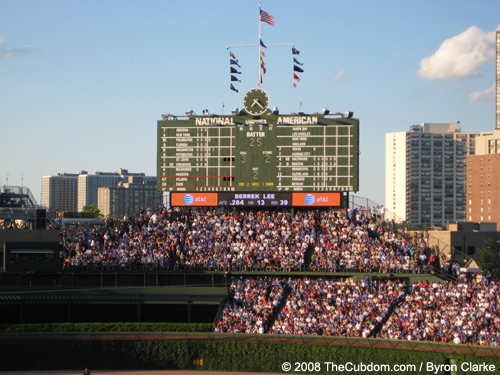 For those unfamiliar with Wrigley Field, the Mezzanine level is below the upper deck and consists of approximately 60 suites that are positioned from left field all the way around to right field. To help create a baseball atmosphere, the WGN radio broadcast is played over the suite speakers, and two televisions are tuned to Len Kasper and Bob Brenly on whatever medium they're announcing for the day. The artwork in the box consists of great photos of Cubs from yesteryear. And finally, in case I missed anything, I've shot a minute of video showing everything in our luxury box. Outside: Nothing too special. 15 seats arranged in three rows of 5. You're very close to the boxes on either side of you, but people seem to be pretty good about not prying into the other boxes. For a few pictures of the view from a Cubs luxury box, here's a post with some of the pictures I took at the game. The only thing that the pictures don't really show is that the upper deck overshadows the mezzanine boxes, so high pop-ups can be obscured. Here's the Cubs' page where I got this official information. 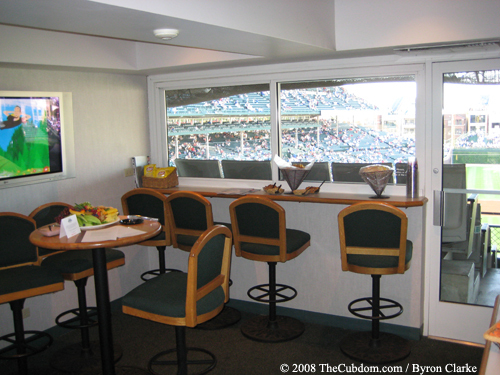 Located throughout the Mezzanine Suites presented by Nuveen, a 15 person suite is a great way to enjoy the excitement of the Chicago Cubs. 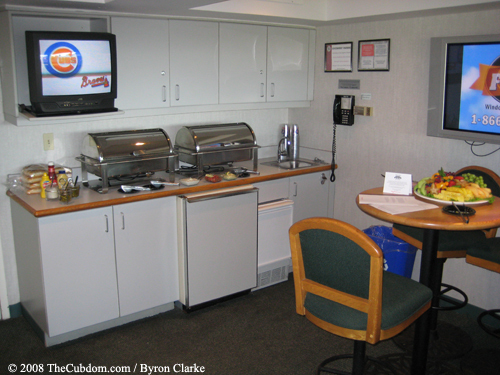 Suites are available to rent on a game to game basis. Seating for your guests outdoors with comfortable space inside. Each suite is equipped with plasma televisions as well. Also included in the rental price are two VIP parking passes. Catering is separate and is available through Levy Restaurants. Cubs Chairman Crane Kenney confirmed that Tribune Co. had sent out the financial books on the franchise to prospective ownership groups Tuesday. 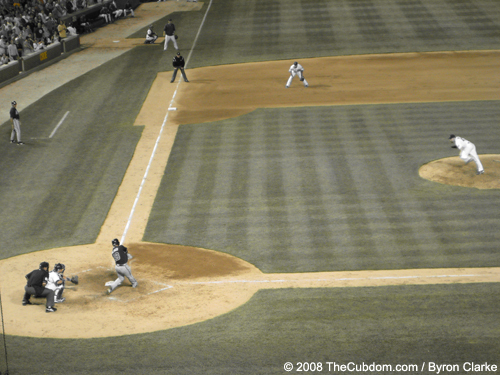 Tribune Chairman Sam Zell recently said Major League Baseball had preapproved nine potential groups and that Tribune Co. would retain a minority interest of about 5 percent of the team. The groups bidding on the Cubs will have a month to study the financial data and make their preliminary bids. The sale is not expected to be completed until after the season. This is a relief for Cubs fans who are already tired of the Sam Zell era. I'd sure love to get my hands on one of those books just to see all of the areas where the Cubs are finding revenues, and the expenses that I don't tend to think about when I visit Wrigley. From the state's viewpoint, Tribune Co. was unwilling to accept a plan that wasn't backed by tax dollars. Tribune Co. believes the acquisition "requires either the transfer of future sales and amusement tax revenue from transactions at Wrigley Field for the next 30 years, or the imposition of new taxes, or the transfer of existing ISFA funds now pledged to projects at U.S. Cellular," Thompson said in a statement Monday afternoon. Essentially, the reason the two groups couldn't come together was that the "value" of public financing wasn't great enough to outweigh the destruction of value that occurs when you saddle the Cubs with rent. Prospective club owners are all unanimous in their desire to own the stadium as well as the team, so a bid for only the club would result in a lower value than the value of the club in a bid that included the stadium as well. Even though the State could finance the deal less expensively than private individuals, Sam Zell was really only interested in adding money to the system. The only way that he could create enough extra value was if the state subsidized the Wrigley acquisition with taxpayer dollars and then passed along those savings in terms of inexpensive rent to the Cubs. This would have introduced a new revenue stream into the picture, thus increasing the value of the club to prospective owners, and letting Sam Zell take a chunk of that for himself. I attended the Cubs game last night and took some pictures. I'll review the Cubs Luxury Box experience later, but here are some particularly artistic photos I took of Wrigley and it's environs. (All of these were snapped from the Luxury Box.) For game action photos, see my GROTA post. I've had a little unreasonable hero worship of Andrew Zimbalist, the sports economics professor, since I saw some of his work while writing an International Baccalaureate Extended Essay as a senior in high-school. Today, the deified professor was interviewed by Stephen Grocer of the Wall Street Journal blog, "Deal Journal". The premise of the interview was: Does Winning Mean a Higher Price for the Cubs? There's some good questions and they explore the issue in some detail, but the kicker for me was at the end. 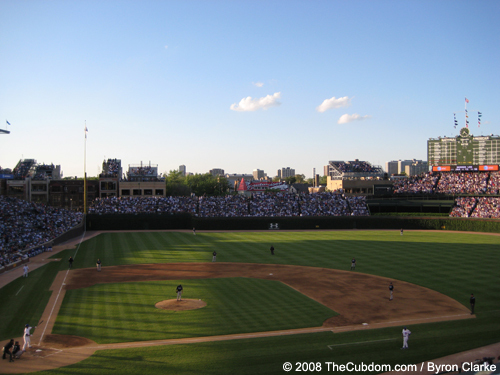 Zimbalist: "I do know that certain perspective owners of the Cubs have talked to the people on the Red Sox about reworking the park. And it’s one of several reasons why I think the best deal for Cubs going forward is for the owner of the team to own the park." This is good to hear from a learned man and helps to reinforce my smug sense of superiority as I've been telling anyone who will listen (not very many) that selling the team separately from the ballpark is in the long term disinterest of every stakeholder in the team, save possibly Sam Zell and the TribCo employees. I was poking around one of my advertiser's sites (Click here for Chicago Cubs Gear) and found one of the greatest gems ever discovered on the interweb. Denver is where Zell said nine potential buyers, preapproved by Major League Baseball, are awaiting release of the team's financial data, which should be sent out soon. He also revealed that Tribune Co. won't completely let loose of the team, carried by WGN-TV, WGN America and WGN-AM 720. "In all likelihood, the company will keep some kind of minority interest in the Cubs," Zell said, as he reiterated his interest in letting a new owner take over. "An asset like that is an extraordinary asset for ego gratification and identification, none of which the Tribune took advantage of … nor do I think they were capable of doing that," he said. "It belongs in entrepreneurial hands and I think that would benefit the team, the city and, for sure, Tribune." It was not immediately clear what percentage of the team Tribune looks to keep. Tribune Co. would realize some tax benefits in such an arrangement, but the small stake would protect its TV and radio assets' long-standing—and financially beneficial—links to the team. A company spokesman declined to expand on Zell's remarks. Oi, this sale process is more unnecessarily dramatic than Monday night's Cubs game. Wasn't the point of TribCo selling the Cubs because Sam Zell had a conflict of interest with his White Sox investment? I'll have to research if that's still an issue, but why should one person have minority investments in two teams? Regardless, I can't help but feel Cubs fans are going to come out worse for the Sam Zell era decisions, but hey, I'm generally wrong about these sorts of things... and a World Series trophy would help heal a great many wrongs. In other news, Chicago's women's soccer team was named yesterday in a ceremony at Toyota Park... and the name is: Chicago Red Stars! I'm very happy about the name as I thought it was the best in the fan voting contest. Red Stars edged out 'Wind', '1871', 'Riot', and 'Blues' among a cadre of other names. Inaugural season ticket packages go on sale tomorrow starting at $99. I'll probably buy a voucher packet and get some friends to go out for a game or two when the weather's nice next summer.